If you happen to be driving through Liverpool, you might want to take a little more care than usual. Inhabitants of the city are some of the dodgiest drivers – clocking up more penalty points than any other place in England and Wales. Figures have revealed that the city has the highest proportion of motorists with points on their licence, with one in eight drivers picking up endorsements for speeding or other driving offences. 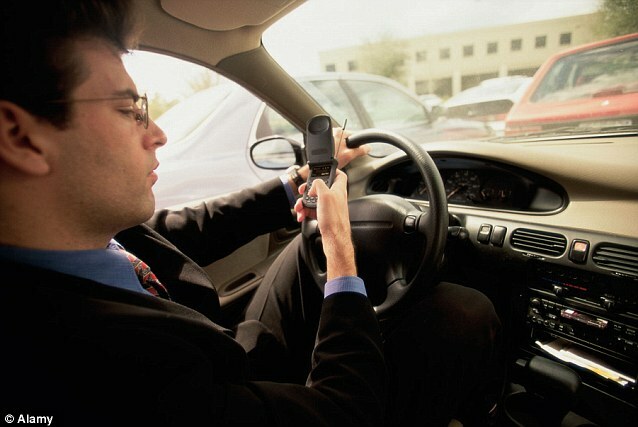 Out of the 433,425 licensed drivers in the city, some 52,179 – or 12 per cent – have at least one point. And 1,802 people have collected a staggering nine or more points. Liverpool was followed by Bournemouth where 11.5 per cent of drivers have points. Other places on the list include Blackburn, Slough, Dorchester, Sunderland, Warrington, Chester, Manchester and Nottingham. By contrast the area of England with the lowest proportion of penalty point transgressors is the ‘EC’ postcode of London, where just one in 18 has been caught committing a driving offence. 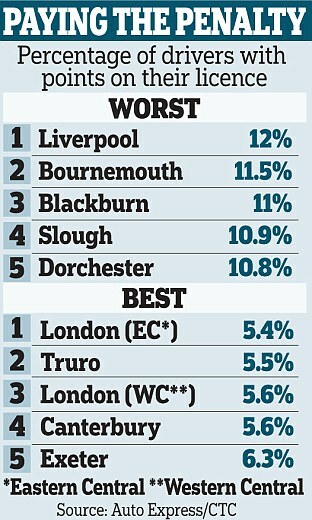 The area’s well-behaved motorists are followed by Truro in Cornwall, the ‘WC’ London postcode, Canterbury and Exeter. But across the whole of the UK it is the Scots who are the penalty points leaders of Britain. 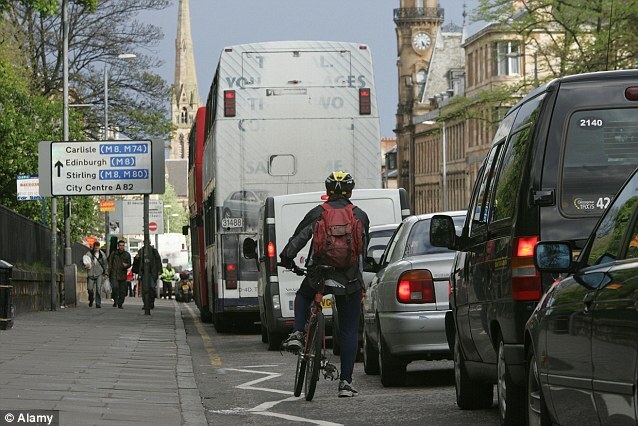 In Glasgow alone, one in seven of the city’s 634,252 drivers have points. Motherwell landed in second place, followed by Kilmarnock and Paisley. The magazine added: ‘Liverpool may have the worst penalty point rate in England, with around 12 per cent of licensed drivers possessing endorsements. However representatives of the charity who provided the original data rushed to defend Glaswegian drivers, saying the spike was simply down to high levels of traffic policing around the city. Worst performers in Wales are Swansea where one in 10 (10 per cent) of the 462,165 drivers have points and Newport (also 10 per cent) - both just ahead of Bradford (10 per cent). Nationally, across the UK more than 3.3 million motorists have endorsements on their licences – or 8.9 per cent of the total. And 97,562 have nine points or more. Across the UK, Lerwick in the Shetland Islands has the lowest proportion of licensed drivers with points where just four per cent of the 14,956 drivers have endorsements, followed by the Outer Hebrides (4.9 per cent). Cycling charity CTC which provided the original data believes the wide discrepancies between areas is mainly due to differing levels of traffic policing. The charity’s policy co-ordinator Chris Peck said: ‘It can’t be just down to driver behaviour that one in eight Glasgow drivers has penalty points, but just one in 20 has in Shetland.